Well, I didn't read nearly as many Anne Rice books as I planned to in 2012, but I still consider this challenge a success. My initial goal was based on drastically underestimating how big her books are, and how quickly I burn out if I read a lot of books of that size and density. I ended up reading 7 Anne Rice books: the first 5 Vampire Chronicles, which were all rereads, as well as The Mummy and The Witching Hour, which were new for me. If you read books for this challenge, don't forget to link up your reviews so the rest of us can check them out! The linky will be open until Jan. 31, 2013. And if you wrote a wrap-up post, feel free to link to it in the comments. 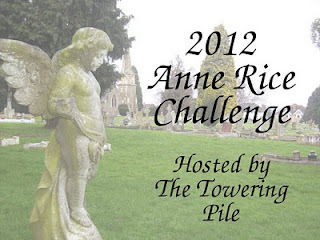 I hope you'll join me again (or for the first time) for the 2013 Anne Rice Challenge!